Remember the song “Smokin’ in the Boys Room”, originally performed by Brownsville Station in 1973, and later covered by Motley Crue in 1985? No? You say you’re not some shriveled up old geezer? Way to hurt a guy. Anyway, I assure you whippersnappers the song was popular, and very much based on reality. But I had a somewhat different reality when I attended Cuyahoga Falls High School in the eighties. For years, Falls High had tried to keep their student body from smoking on campus as you might expect. During lunch breaks, young nicotine addicts could go off school grounds and enjoy their cancer sticks without fear of being hassled (yes, we were allowed to leave school grounds for lunch, something that would never happen today). But if you got a craving during class time, you had to sneak into the bathroom or some other inconspicuous place to get your fix. And of course if you did that, you ran the risk of getting busted. By 1979, the administration at Falls High had evidently given up, deciding it would just be easier to keep the smoking contained in one small, unsheltered area of the parking lot rather than play whack-a-mole with determined youthful tobacco addicts. And so it was that The Pit was born. Originally known as "The Pig Pen", by the time I was a student, this designated smoking area had been given the more dangerous sounding sobriquet “The Pit”. What wannabe juvenile delinquent could resist a cool name like that? It was illegal even in 1979 to sell tobacco to anyone under 18 (although the minimum purchase age had been 16 for a while in the sixties and seventies). Enforcement was lax, however, and chances were the Lawson’s on the corner wasn’t going to card you, even if you looked like you were 12. And if they did, you could always use one of the many cigarette machines located at bars, restaurants, and donut shops all over town. Hell, some students probably had parents who bought smokes for them like it was no big deal. So, it was not uncommon to see quite the crowd of teens outside puffing away before school, after school, at lunchtime, and until 1984, even between classes. This probably sounds unfathomable to younger readers, but one has to put it in the context of the times. As Falls High alum Jim Bosecker explains, “18 year olds had been given the right to vote [in 1971]. They were considered to be adults and were starting to be given adult privileges.” And dammit, one of those privileges was the right to contract lung cancer! One also has to keep in mind that smoking in general was just a more accepted part of American culture in the seventies and early eighties. Back then, department stores still set out ashtrays so customers could puff while they shopped. You could smoke on airplanes, too. Smoking wasn’t banned on flights until 1990, and even then, only on flights less than 6 hours in duration. And if you went to a bar, concert, or sporting event, you had to accept being enveloped in a huge, noxious cloud of tobacco fumes that seeped into your clothes (and your lungs) as part of the experience. Cigarette ads had been banned on TV since 1971, but in movies and on many shows, the cool characters were very often smokers. Giving teens their own smoking area on school grounds in this context must not have seemed all that unreasonable. If there’s one thing that’s always been true of smokers, it’s that they will put up with almost anything to get their fix. I know, I used to be one. Not at the time. I started in my mid twenties like a dumbass and puffed away 15 years and countless dollars before I quit. But I digress. The bottom line is, I know that snow, rain, wind… none of that matters when you get that craving And not unlike the U.S. Postal Service, there was no sort of inclement weather that could keep the Pit crew from making their appointed rounds. Even in nice weather, the Pit was not exactly the most pleasant environment. 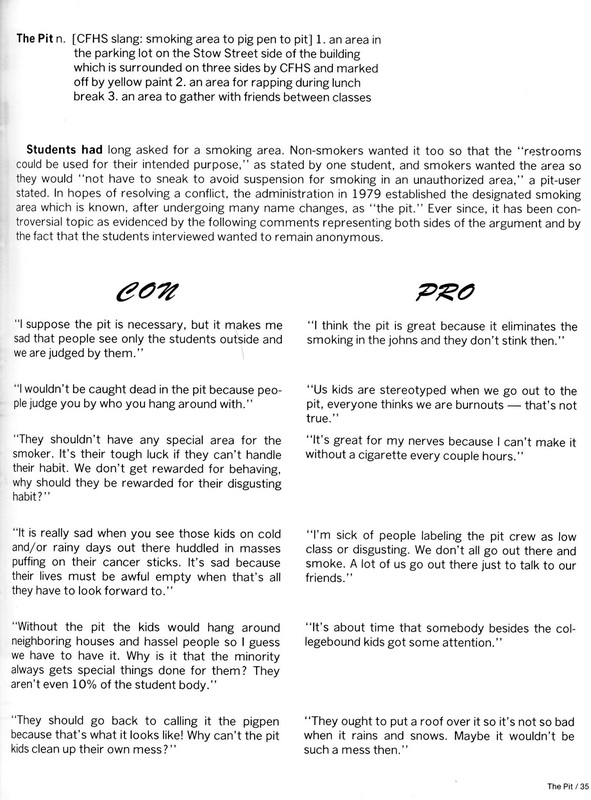 According to Falls High grad Shawn Rehs, “The maggots from the big trash bin were always pretty nasty, and the smell of garbage juice was not good.” So hey, at least there's one bright side in that smokers usually lose their sense of smell. Things were a little less “wild west” by the time I became a Freshman at Falls High in 1984. As former Falls High teacher James Pivarski informed me, "When I arrived in ‘83 it was a chaotic mess. Starting in the Fall of ‘84, [parental] permission was needed. You could go there before school, during your lunch period, and after school for a short time. Eventually the Board of Ed abolished it. Later the State of Ohio banned smoking on school campuses." These days most states, including Ohio, have much stricter laws regarding where smokers can indulge their habits. There's also a trend to raise the age to purchase tobacco to 21, with several Ohio cities having done so already. And you'd be hard pressed to find anyone who seriously still believes that cigarettes are neither dangerous or addictive, which wasn't necessarily the case in the seventies and eighties. 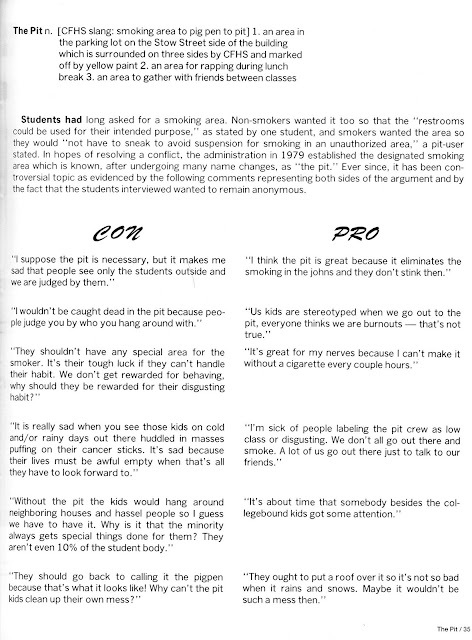 As a result, it's doubtful any school in the United States would sanction tobacco use by their students in this way ever again, which is probably for the best. On some level I think it was comforting to know there was a place on school grounds where things could get a little dangerous, but not too dangerous. Hardly worth getting lung cancer or emphysema over, I suppose, but why spoil nostalgia with facts? My sincere gratitude to everyone on the You Know You're From Cuyahoga Falls When... group for their memories, both those quoted and those not. My own memories were a bit hazy, and of course limited to my time at the school. You really helped flesh this post out. 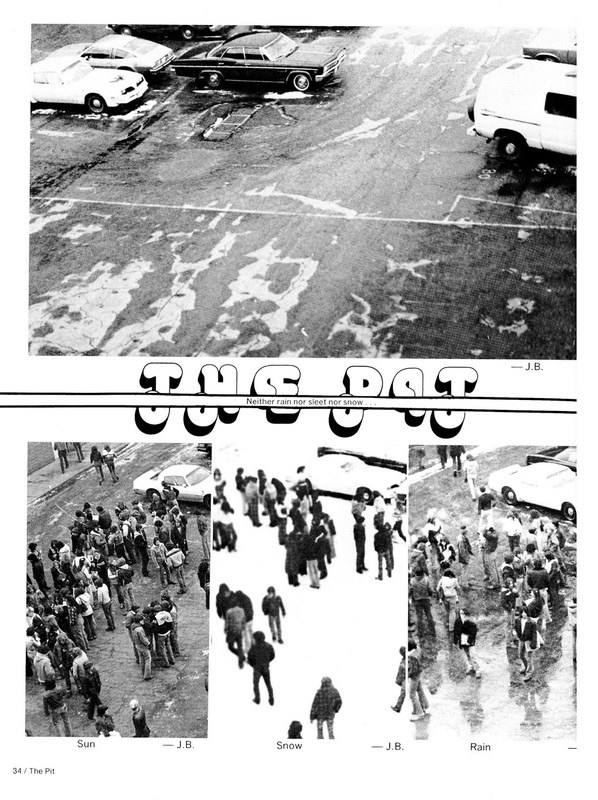 Special thanks to Dawn Boss Tallent for the image scans from the 1981 Cuyahoga Falls High School Yearbook. I know from other comments that Falls High wasn't the only school to have a designated smoking area for students. If you have memories of lighting up while getting your education that you'd like to share, regardless of where you went to school, please feel free to comment.